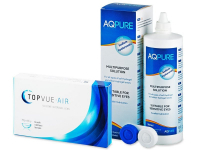 AQ Pure contact lens solution is gentle and effective for all types of soft contact lenses. Its multipurpose formula cleans lenses thoroughly and helps to ensure lasting moisture and comfort. AQ Pure is a versatile solution containing an elastic polymer with properties to bind large quantities of water. This ensures perfect moisture of the lenses during all-day wear. Lenses cleansed with AQ Pure solution do not cause irritation or redness of the eye. The package contains one 360 ml bottle of solution and a contact lens case. Thanks to its highly efficient lens lubrication, AQ Pure is suitable for users with sensitive eyes. It provides superior comfort to anyone with sensitive eyes or allergy sufferers. This high-quality, effective solution provides the best care for all users. The solution is intended for disinfection, storage, cleaning, rinsing and hydration of bi-weekly and monthly contact lenses and effectively removes all protein deposits. The pH of the solution is compatible with the eyes, eliminating the possibility of eye irritation. AQ Pure Solution is designed to disinfect lenses in two ways: with rubbing and without. After rubbing the lenses with solution in your palm, they should be left in a case with solution for at least 5–7 minutes for optimal disinfection. If you do not rub the lenses in your palm, they should be left submerged in solution for at least 2–3 hours, according to the manufacturer. However, eye specialists recommend always rubbing your lenses before placing them in a contacts case, as it greatly increases the effectiveness of disinfection. Good solution; very effective for my dry eyes. HOping you'll offer it in bulk at some point. Great communication wth your customer service regarding my order. Payment issues cleared up quickly and easily. Many thanks. Really pleased with this solution. Used Renu for years, and just felt it wasn't cleaning my lenses thoroughly. I've noticed a big improvement with this solution. Great, easy ordering and delivery. Your rep helped me out when there was a glitch on your site, but everything worked perfectly with your help. Good solution. I've had trouble with other brands causing dry eyes (or at least not helping the situation) No trouble with this. Pleasant feeling throughout the day. Very impressed with both this solution and the service I received through your website. No nonsense and hassle free. Hadn't heard of this brand, but I'm very happy with the results. Clean, clear lenses, and dispatched almost immediately. Very smooth ordering process. Thanks for the excellent communication and service. Great solution, and the package arrived very quickly. Thx for the speedy delivery. This works great for my sensitive eyes. Lenses feel great in the morning, and throughout the day. Hello, how long is possible to keep the solution AQ Pure open? Hi, Cindy, Thank you for your recent comment. It's inadvisable to leave it open for long periods of time, but leaving it open shouldn't have too much of a bad effect!